Sara Beckman is a Berlin School faculty member teaching innovation design. new courses on design, entrepreneurship in biotechnology, and new product development, won four awards from MBA students for excellence in teaching, and received the Berkeley campus Distinguished Teaching Award. 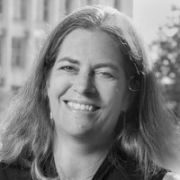 Sara Beckman has also taught for Stanford University’s Department of Industrial Engineering and Engineering Management, and been a visiting faculty member at MIT in both 1994 and 1999 where she taught in the Leaders for Manufacturing Program. design, manufacturing education and training, and environmental, health and safety management throughout the company. Before joining HP and the Haas School, Sara Beckman worked in the Operations Management Services practice at Booz, Allen and Hamilton where she developed manufacturing strategy in a number of diverse industries from pharmaceuticals to aerospace.